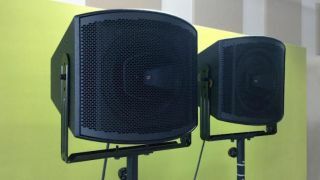 The What:Fulcrum Acoustic has launched its latest product line: CCX12 12-Inch Subcardioid Coaxial Loudspeakers. Joining the CCX1295 (90 degrees by 45 degrees) announced last summer, the line now features a full range of horn patterns allowing coverage to be tailored for a wide range of applications. The What Else: The CCX12 product family includes the CCX1265 (60 degrees x 45 degrees), CCX1277 (75 degrees x 75 degrees), CCX1200 (100 degrees x 100 degrees), and CCX1226 (120 degrees x 60 degrees). This line marks the first application of Fulcrum's Passive Cardioid Technology in its TQ Install line of installation loudspeakers. CCX12 loudspeakers provide 9dB of low-frequency attenuation in the rear hemisphere without requiring additional cancellation drivers, amplifiers, or signal processing channels. "Unlike conventional loudspeakers that trade off low-frequency (LF) directional control for compact enclosures, our Passive Cardioid Technology enables CCX12 loudspeakers to achieve unprecedented LF/HF control for products of their size," said Fulcrum Acoustic co-founder and vice president of R&D David Gunness. "Combining the benefits of this technology with Temporal Equalization (TQ), single-amplified CCX12 products deliver impressive LF directional control, improved intelligibility, enhanced sonic accuracy, and the output capability and pattern control of normal premium two-way systems in considerably lighter and more compact enclosures than those with offset drivers."